The Syrian government says its forces have regained total control of the central city of Homs after rebels left the last district under their control. About 700 rebels and their families, a total of nearly 3,000 people, were evacuated on buses from al-Wair district, government officials say. "The city of Homs is completely clear of weapons and militants," provincial governor Talal Barazi said. 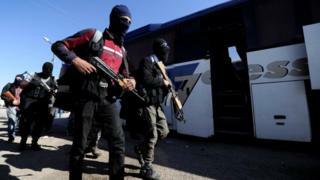 Many fighters were going to the rebel-held Idlib province, in the north-west. Some were heading to Jarablus, an area in northern Syria controlled by rebels backed by Turkey. Most of the rebels had been driven out of Homs in 2014, after years under siege by government forces. A Russia-brokered evacuation deal was agreed earlier this year. Under the agreement, opposition fighters are granted safe passage with their weapons out of Homs to rebel-held areas in Syria. The Syrian government says such "reconciliation" deals, which have been agreed in several rebel-held areas, are key to ending the six-year civil war. Opposition fighters say that they have been coerced into such agreements by brutal sieges and bombardments. Homs became a key battleground of the Syrian uprising after residents embraced the call to overthrow President Bashar al-Assad in 2011 and drove security forces out of much of the city the following year. That prompted the government to begin a two-year siege that left whole areas destroyed and eventually forced the rebels to withdraw from the Old City to al-Wair. More than 300,000 people have been killed across Syria since 2011.